Learn how to include this year’s hottest new eco-chic accent, paper straws, into seasonal drinks & desserts just in time for your Autumn events. I am so excited that I get to do an article on one of my favorite eco-chic accents, paper straws. 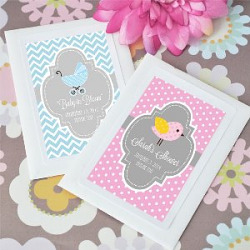 Click on any event planner's Pinterest board and you'll see them in multiple drinks and dessert tables. You may be asking why. There are two very good reasons. They are way better for the environment than plastic straws and they come in a variety of colors to match any event scheme. With fall and winter right around the corner, I wanted to give you some ideas on how you can incorporate our new colored paper straws into your autumn harvest festivals, Halloween parties, winter weddings and holiday gatherings.As I tell everyone, the uses for these paper straws are endless.Because of that (and the fact that I know you don't have time to read a novel-sized blog right now), I focused on adult treats and drinks in this article.Don't worry, kidlet party-throwers, munchkin-friendly drinks and treats will be discussed in a future blog post! October brings one of my favorite holidays - Halloween. Whether you are planning a spooky shindig or a wonderfully weird wedding, there are several color palettes that are traditional. Ecopartytime carries striped paper straws in black, orange, purple, and gray. Why not use purple and black as your main colors to throw a girls-only spooky soiree complete with a purple Witchy Woman cocktail made from organic spirits? Accent this delicious drink with one of our new orange or black striped paper straws. Have you always felt sorry for Dr. Frankenstein? Do you understand Dr. Jekyll's torment? 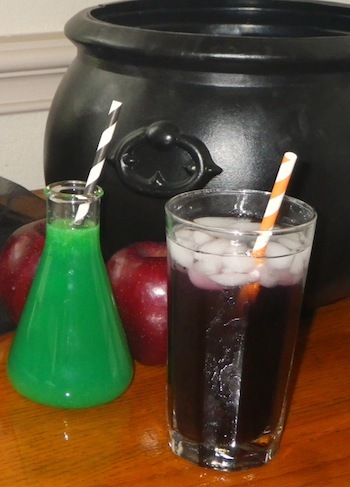 Why not create a creepy laboratory experience for your guests with an organic Mad Scientist potion served in a scientific beaker with purple paper straws. 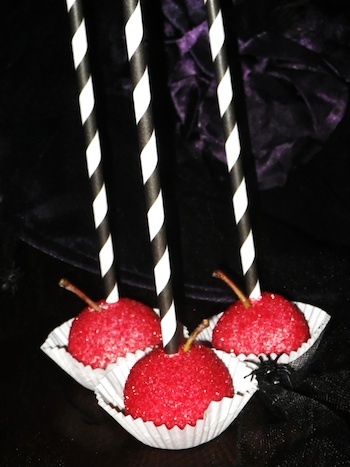 Instead of the childhood game of bobbing for apples (which all women know messes up the make-up and hairdo), why not offer your adult guests a wickedly delicious Caramel Apple Truffle complete with twisted black and white paper straws. For less spooky and more harvest, I recommend sticking with traditional flavors and colors for your holiday cocktails. Ecopartytime carries paper straws in orange, brown red, and yellow. One of my favorite cocktails of all time is a Chai-tini. It's so yummy and spicy and just tastes like the best parts of a pumpkin pie. You can serve it chilled in a martini glass or blend it with ice for a yummy frosty drink. I'd add a brown or orange striped straw to stir and sip this delicious concoction. Another prevalent fruit in the fall is the apple. 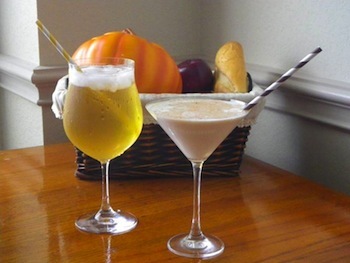 For all of you holding fall weddings and festivals, an Apple of My Eye cocktail can really set the fall flavor for an event. 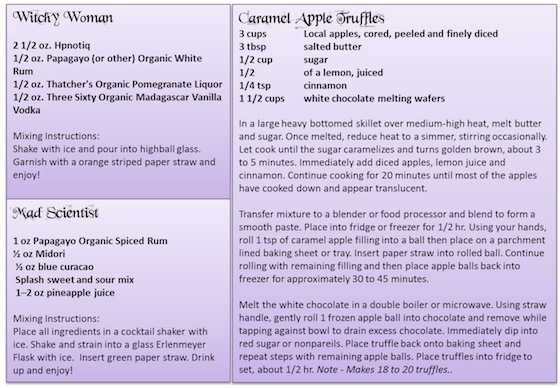 Made with organic apple liquor and spiced rum, this drink would make Johnny Appleseed lick his lips. 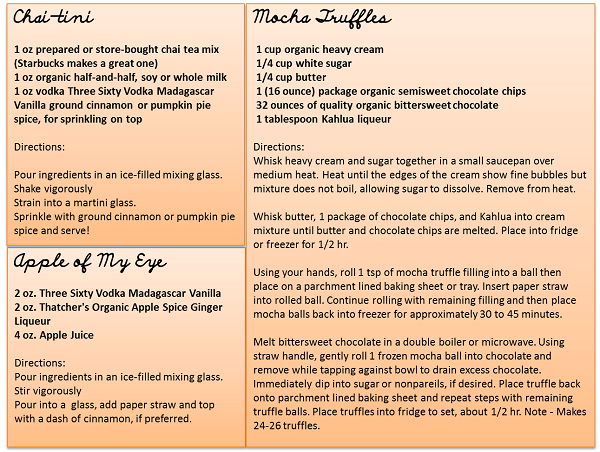 If you're looking for a grown-up dessert which is easy to eat, consider serving delicious Mocha Truffles or cake balls on orange, brown or yellow paper straws. Expert's note - The straws are longer and easier to hold onto than an average sucker stick and really pop color-wise. Keep an eye out for part 2 which includes wonderful winter weather cocktails! Until next time, my party people, I wish you "Love, Laughter & Happily Ever After. . ."